Why Schedule AC Repairs This Late in the Season? Coming in October: A Big Change in Your Utility Bill! The City of Fort Collins is changing its utility billing structure to address peak demand use. Come October 1, 2018, Fort Collins Utilities will be switching to time-of-day pricing. This change will be reflected on your November utility bill. Fort Collins Heating & Air Conditioning wants to help you understand what these changes mean and how you can save on increased utility rates coming to Fort Collins, CO. Unlike your gas utility that can be supplied constantly and be sitting, waiting for when you need it, electricity is much different as it must be produced on demand. This creates challenges and increased costs during the peak demand times, and worst-case scenario, electric providers can’t produce enough to supply the demand and the power is reduced. In some instances, you may not lose power completely, but voltage drops and certain appliances don’t work correctly. This is called a “brown out”. A “brown out” is hard on motors and compressors and can cause damage to devices. You will even experience dimming of lights. In comparison to current utility rates, off-peak billing is going to reduce slightly (about 35%) when you use the least amount of energy, and it is going to increase by 150% during peak times when you are home using electricity the most. With zero change in behavior, you could see your utility bill go up two to three times what it is now. For example, if your electric bill is currently $100 it could very likely go to $200 or even $300 immediately. 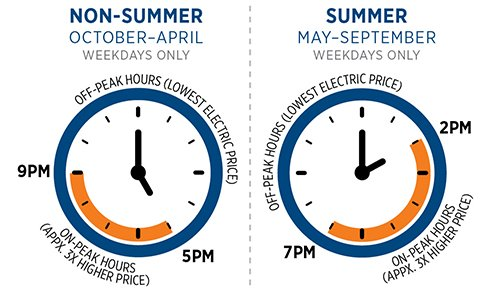 Here are the times that you will pay much more for your electricity. Invest in LED bulbs and keep lights off when not in use. Consider installing timers on bath fans and lights in rooms that tend to be occupied for short times. Install a programmable thermostat to adjust the temperature in your home during the day to help heat and cool during off hours so that you can use less energy during peak hours. Install bath fans that have high-efficient ECM motors and humidity sensors to turn on and off automatically. Plan to do laundry during off peak times. If you have an electric dryer, it could cost you between $1.50 to $2 to dry your clothes. Avoid electric stove top, oven and microwave cooking. Plan more crock pot meals in the winter to be ready by the time the rate changes and utilize outdoor BBQ cooking in the summer. Use the timer for delay start on your dishwasher to start after the peak time. Potentially using your gas fireplace rather than running the furnace and fan depending on your situation (consult your expert HVAC company). Maintaining your heating and cooling equipment by having it serviced, cleaned and running efficiently will be even more important with the new utility rates. Keep your dryer lint screen clean and have your dryer vents cleaned. Consider converting your electric appliances such as clothes dryers, ovens and cook tops to gas. Schedule a maintenance visit on your HVAC equipment to make sure that it’s running at peak performance with the experts at Fort Collins Heating & Air Conditioning.